Henry Clark "Hank" Barrow was born in Louisiana either in 1905 or 1906. In the 1910 U.S. Federal Census, he was the second of four sons born to Charles and Hermine. They lived in New Orleans, Louisiana at 4850 Constance Street. His father was a salesman. In 1920 the family of seven remained in New Orleans at a different address, 4854 Magazine Street. Information about Barrow's education and art training has not been found. Ten years later Barrow still lived with his parents in New Orleans, a few blocks away from their previous address, at 5357 Magazine Street. His occupation was newspaper artist. In the early 1930s he illustrated the serialized story, "Santa and the White Rose." In the mid-1930s he took over Milton Caniff's panel The Gay Thirties. The Times-Picayune (New Orleans) published this article on April 24, 1939. 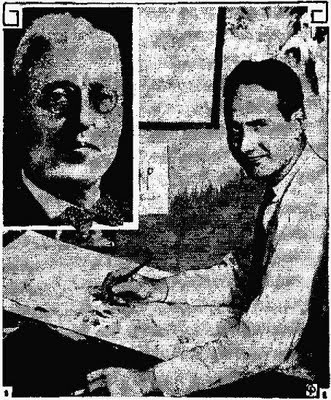 Henry Clark Barrow, former cartoonist for The Times-Picayune who now draws the daily comic panel "The Gay Thirties" for the Associated Press features service, was married to Miss Katherine Lord Eyerly in New York Saturday [April 22]. Mr. Barrow is the son of Mr. and Mrs. Charles Barrow of New Orleans. The bride is the daughter of Mr. and Mrs. Elmer Kendall Eyerly of Hagerstown, Md. The bride, wearing navy blue and a white flowered hat, was attended by a sister, Miss Margery Eyerly, and was given in marriage by her father. The best man was Charles A. Grumich, night city editor of The Associated Press in New York. The wedding was followed by a large reception at the Fifth Avenue hotel. In the early 1940s, Barrow produced the strip Things to Come. On April 18, 1946 the Daily Mail (Hagerstown, Maryland) reported the following. "Hank" Barrow, famous Associated Press editorial cartoonist, is the subject of a feature article in the latest issue of "AP World," a special publication for AP members and staffs. Mr. Barrow's wife is the former Miss Katherine Eyerly, daughter of Elmer K. Eyerly, this city. 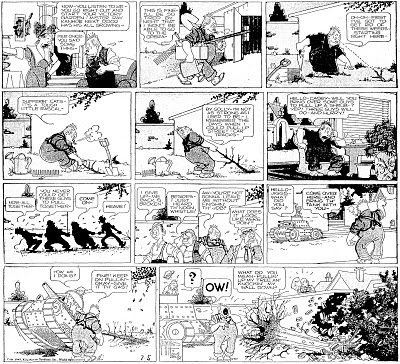 The article is illustrated, and describes how Barrow conceives his cartoons. One of Mr. and Mrs. Barrow's two sons shows sign of having inherited the artistic talent, the account states. Barrow draws the cartoons which appear daily on the editorial page of the Daily Mail. Barrow's talent was recognized by his peers, and was reported in The Gazette and Bulletin (Williamsport, Pennsylvania) on March 20, 1947. New York (AP)—Henry (Hank) Barrow of the Associated Press and Reuben (Rube) L. Goldeberg of the New York Sun were presented bronze medals and plaques Tuesday by Sigma Delta Chi, national journalism fraternity, for distinguished service in editorial cartooning. The awards were presented by Julien Elfenbein, president of the local chapter, in behalf of the national headquarters of the fraternity at a gathering of members of the New York professional chapter of Sigma Delta Chi and theta Sigma Phi, national journalism sorority. 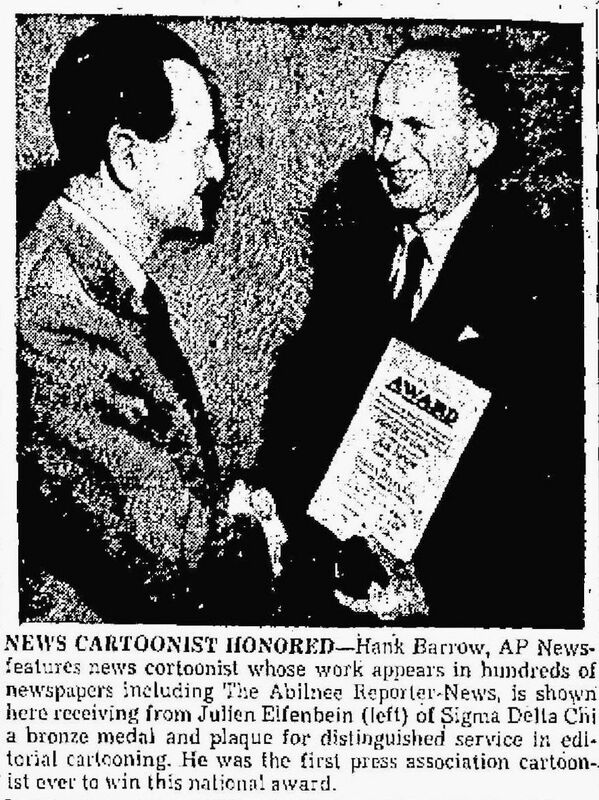 Barrow was the first press association cartoonist ever to win the award. Goldberg received his award for an editorial cartoon titled "It Must Be a Leak." In 1949 Barrow joined the staff of the World-Herald (Omaha, Nebraska); his first editorial cartoon was published on August 9, 1949. His cartooning past was mentioned on January 25, 1953. …A 30-year veteran of the drawing board, he began his career with the New Orleans, La., Item. He also was staff artist on the New Orleans Times-Picayune before joining the Associated Press in New York in 1934. 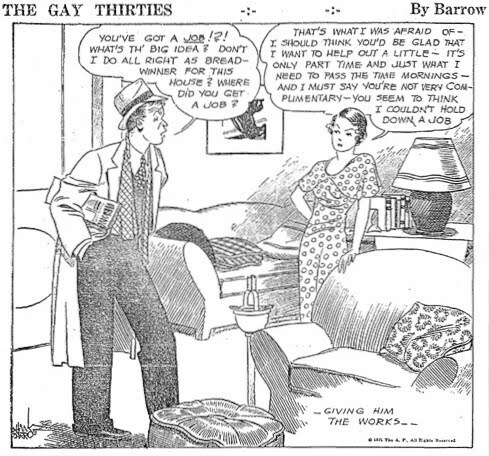 During the 1930s Mr. Barrow did a one-panel cartoon, appropriately entitled "The Gay Thirties." The cartoon was distributed to many newspapers by the Associated Press. It was much like The World-Herald's comic, "Out Our Way" cartoon, usually featuring children's antics. Its death, said Mr. Barrow, was in its title…. His work day was described on October 13, 1964 in the World-Herald. A National Newspaper Week Profile: Admirers of the World-Herald cartoonist Henry Barrow are forever asking where he gets all his ideas. They'd really be impressed of they knew that Hank works up at least three ideas for every cartoon that gets into the paper. The Barrow work day begins at about 8:15 when he arrives at the office and begins a casual reading of the morning paper. By 11:30 a.m. he has completed rough drawings for three suggested cartoons. Editor Walter Christenson takes a look at the suggestions and picks the one he likes. Hank applies the finishing touches to that one for his 1:30 engraving deadline. The New Orleans-born cartoonist has followed that general routine throughout his journalistic career, including a 15-year stint in New York when he drew a daily cartoon for the Associated Press. His fertile imagination was on a 4-for-1 schedule then, too, and sometimes 5-for-1. 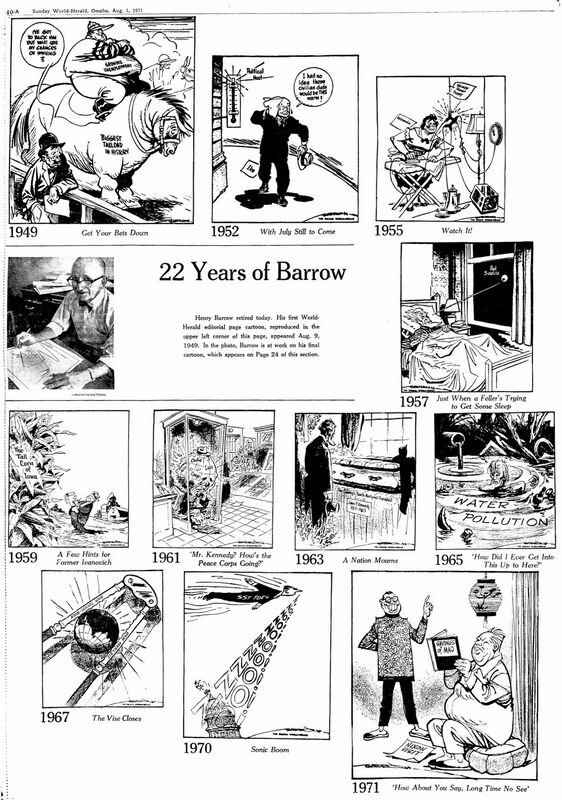 More than 150 papers used the Barrow cartoons regularly. But he quit the A.P. in 1949 to join The World-Herald because he wanted a chance to take a stand on controversial issues. It was tough trying to function under the A.P. 's anemic impartiality codes, he said. What was the point of being an editorial cartoonist if you couldn't express an editorial opinion? With the A.P., he had found himself dealing with an endless chain of non-controversial subjects, such as coming of spring, motherhood and the arrival of the baseball season. Barrow retired from the World-Herald on August 1, 1971. Executive Editor Louis G. Gerdes wrote, "Unlike some cartoonists, Henry Barrow was extremely generous in passing out originals of his more than 6,000 drawings that appeared during his nearly 22 years with The World-Herald…." On page ten was a selection of his best cartoons. Barrow passed away on September 1, 1985. On September 4 the Orlando Sentinel (Florida) published the following. Henry "Hank" Barrow, 79, a former cartoonist for the Omaha World-Herald and The Associated Press, died Sunday. 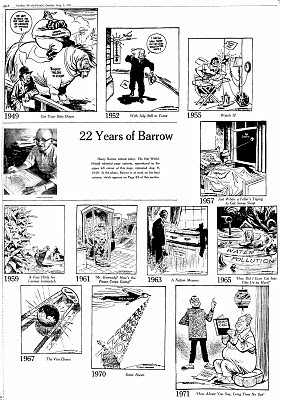 Barrow retired from the World-Herald in 1971 after drawing more than 6,000 cartoons for the newspaper. He joined the World-Herald in 1949 after 15 years with the AP in New York. On the same day, the Chicago Tribune (Illinois) said he "died at age 79 after suffering a stroke, his family said." Thanks, Ger. I look forward to your Barrow scans. Well, they are still waiting to be scanned... but I got around to doing the first four. I have two cartoons, framed, signed and look original. Ic an send photos if I had an email for you. Hank Barrow was a pioneer in the comic strip world,but he was an even taller giant to his family. Papa he will always be to me! The moment he saw I was to be left handed he took me to his "office" on the top floor of his house and that is where my education began! I will forever cherish the time slant with him, and his homemade b'day cards. Sitting with him, listening to Peter and the Wolf by Prokofiev, he was the best part of my childhood. 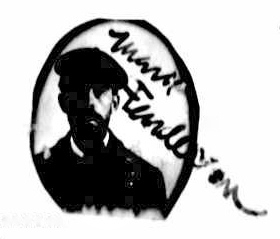 Marcus Mitchell "Mark" Fenderson was born in Monticello, Minnesota, on August 1, 1863, according to a 1904 passport application (see photo) at Ancestry.com. His middle name was his mother's maiden name; according to Historic Homes and Places and Genealogical and Personal Memoirs Relating to the Families of Middlesex County, Massachusetts (1908), "…Myra Abby [Mitchell], born 1833: married Reuben Fenderson, of Wilton, Maine". In the 1870 U.S. Federal Census, he was their only child; they lived in Farmington, Maine. His father was a retail grocer. The New York Times obituary, December 7, 1944, said, "…His father died when he was a small boy, and his mother sent him to her brother's school at Billerica, Mass., for his preparatory training. His uncle, noticing the youngster's artistic bent, encourage him to take up art, and he eventually studied in France and Italy. He began his career as a newspaper illustrator of news events." He has not been found in the 1880 census. "Mr. Fenderson, we desire to know where you were born." "And when did you first become an artist?" Mr. Fenderson was plainly embarrassed by this question, so we altered it in accordance with nature. "I believe not. I just came up quite naturally. After being born in Minnesota I lived in Maine, and after arriving at the tea stage in my career found myself as far West as Chicago. It was then that I began to draw pictures." "I wouldn't dare tell you explicitly. It is sufficient to say that they came under the head of cartoons. I suppose I must have grown tired of Chicago, and so I found myself drifting East, and in the course of time I sought Pittsburg as a haven of refuge." "I continued to draw cartoons for the papers for some three years. Then once more the spirit beckoned." "And to Life. Yes. I haven't yet recovered from the crisis of having my first picture in Life." "...And now that we have you regularly installed as one of our best contributors, can you not tell us something more about yourself? You are too modest, and not explicit enough." "I can tell you of a thing that once happened to me, which it seems to me worth while recording. One day when I was a boy I called in Boston upon F.G. Attwood." "You mean the Life artist who used to delight as many of our readers." "Yes. Even at that time I had artistic aspirations, and I asked Mr. Attwood if he thought it paid to be an artist." "He said: 'My boy, it is the only thing that pays, whether you get any money or not.' And I have been thinking of that ever since." In the 1900 census, he lived in Manhattan, New York City at 54 Union Square. He had been married six years to Anna, who was not counted. The year of his birth was recorded as 1862. He drew the strip Mannikinland for the New York World beginning April 1900. According to a passport application, the couple traveled out of the country in September 1904; the destination was not stated. His address was 52 Union Square. In December 1904 he produced The Baby for McClure. The New York City Directories for 1902, 1903 and 1906 listed him in its illustrators category at 52 Union Square East. He lived in Manhattan at 2 West 18th Street, according to the 1910 census. He was a magazine illustrator and Annie was an artist. The American Art Directory, Volume 10 (1913) listed the couple at "4 West 18th St., New York, N.Y." In American Art Annual Volume 12 (1915) their address was "144 West 23d St., New York, N.Y." The New York City Directories for 1916, and 1926 through 1929 listed him in its artists section at 144 West 23rd Street. He has not been found in the 1920 census. The New-York Tribune covered the Society of Illustrators "Playtime" exhibition on May 13, 1922: "The exhibits…consists of paintings, drawings, wood carvings, masks and trinkets made by the illustrators in the spirit of diversion from the beaten track of their profession….Mark Fenderson makes a specialty of collecting tin cans which he warps into clever candle holders for the sake of amusement…" He contributed drawings to the 1924 book The Life Story of an Ugly Duckling by Marie Dressler. The American Art Annual Volume 22 (1925) listed his address as "144 West 23d St., New York." The 1930 census listed Fenderson in Hastings on Hudson, New York at 423 Farragut Avenue. He was a college teacher and his wife made miniature paintings. The New York Times said he was an art instructor at the Townsend Harris High School in New York. A Richmond Times-Dispatch article, dated February 16, 1930, reported his artistic development in wood carving. When a famous wood carver gave a discarded work bench and some tools to his friend, Mark Fenderson, a few years ago, neither of them had any thought that from it would spring one of those developments that give to art its perpetual youth and freshness. Fenderson certainly did not want to be a carver. He admired good carving, but saw it as a craft rather than an art. That he took it up at all was more to stop his friend's nagging than from desire, and there was no reason for any one—even Fenderson himself—to suppose that anything would come of it: he has been more surprised than any one else to find that it could be a rare medium for artistic expression…. Fenderson's point of view was of something totally different. Essentially an artist and illustrator, he is a skilled draftsman with an unusual feeling for perspective and proportion. With a complete disregard for the hoary traditions of wood carving, he considered its possibilities as a medium for the art that he knew. With wood as paper and tools for a pencil he took it up avidly, but with no idea of all that was to be learned: the preparation of the wood, the use of various tools, and the technique of getting on wood the effects that were in his mind. Needing surfaces to decorate he built furniture of his own design; first chests, then tables, chairs, a bed, a desk, a desk-easel for Mrs. Fenderson's miniature painting—all for the furnishing of his studio and apartment. With each piece there came greater facility in the use of tools, more insight into the possibilities of the medium, and a distinct advance over those that had gone before…. According to the 1940 census Fenderson was a widower living at 429 Farragut Avenue in Greenburgh, New York. His occupation remained as teacher. The New York Times said he retired from the staff of Townsend Harris High School in 1941. Fenderson passed away on December 7, 1944, in Dobbs Ferry, New York. His death was reported in the Times and Herald Statesman (Yonkers, New York), and both said he was 71. The Hartford Courant (Connecticut) gave his age as 73, while the Associated Press reported it as 79. He was 81, based on his passport application. 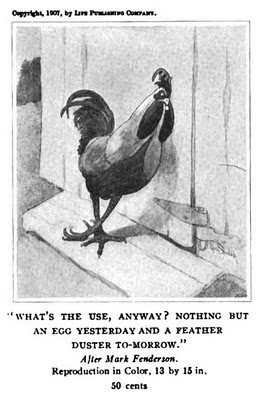 The reports of his death mentioned his best-known and widely distributed cartoon of a sad rooster leaning against the coop, "The Dejected Rooster". numerous periodicals such as Country Life, Current Opinion and Life. The Lewiston Evening Journal Magazine, February 10, 1945, profiled Fenderson. I was changing some pictures around in some old frames my grandparents gave me and found a copy of this "the dejected Rooster" turned backwards. Its now turned facing the right way and displayed on my wall. Emil Samuel "Zeke" Zekley was born in Chicago, Illinois on February 11, 1915, according to the Cook County, Illinois, Birth Certificates Index, 1871-1922 at Ancestry.com. His family name was Szekely, and his middle name was spelled "Samuell". His father's name was Alex and his mother's name and maiden name was Mary Herz. In the 1920 U.S. Federal Census, the family of four lived in Detroit, Michigan at 336 Goodwin. The enumerator spelled the family as "Zekely ". The parents were Hungarian emigrants; Alex arrived in 1913, then Mary in 1914. Their youngest son was Fred, who was born in Michigan. The father was a machinist in the auto industry. The California Death Index said his parents and brother passed away in Los Angeles. It's not clear if the family had moved together or if Zekley went first and the family followed. On February 5, 1942 his father passed away. Zekley enlisted in the army on May 6, 1943; he had a year of college and was married. On the NCS website, Zekley said, "...WWII; in army, but luckily stationed nearby—was able to work on B.U.F., as well as cartoons for the military—1944, now collaborator!..." McManus passed away on October 22, 1954, and Zekley was passed over to continue Bringing Up Father. King Features assigned the strip to Vernon Greene, according to Bringing Up Father: From Sea to Shining Sea. Zekley's mother passed away April 27, 1957. On the NCS website, Zekley said, "...created Dud Dudley for McNaught—it didn't fly—later, Peachy Keen and Popsie. I still had Sponsored Comics (McDonalds—Squirrel's Club (10 yrs. ), U.S. Army's P.S. magazine—others—produced animated TV spots in partnership with Friz Freleng—many awards—Hobbies: collecting fine art and golf! His brother passed away in November 1985. Zekley passed away April 28, 2005, at his home in Beverly Hills, California. His death was reported on the Animation World Network website. Jack R. Wilhelm was born in Fulton, Kentucky on July 28, 1903, according to a passenger list at Ancestry.com. In the 1910 U.S. Federal Census, he lived with his mother, younger sister, and maternal grandparents in Oklahoma City, Oklahoma at 218 East Sixth Street. The name of his father is not known or what happened to him. Ten years later Wilhelm remained in the same city but at 300 East Sixth Street. He was not employed. Information about Wilhelm's art training and how he started in comics has not been found. Apparently he moved to New York City in the 1920s. 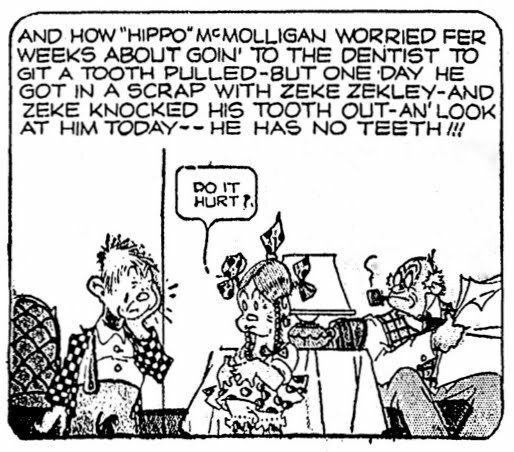 Starting in 1927 he produced Meet the Misses for the McClure Syndicate; the panel ended in 1929. His next McClure strip was That Certain Party which ran in the Rockford Republic (Illinois) starting on August 6, 1928; it was undated but numbered in most panels. The main character, Mary Ellen, resembled actress Louise Brooks. In some papers, such as the Rockford Morning Star (Illinois), the strip was known as Mary Ellen. A few years later, That Certain Party evolved into Nancy (Norton) which was published in the Morning Star from April 5 to May 16, 1931. Wilhelm has not been found in the 1930 census. In the summer of 1931 he was on another strip but with a different syndicate. The Morning Herald (Uniontown, Pennsylvania), published the Central Press announcement, on July 20, 1931, of the debut of Frank Merriwell's Schooldays. Almost three years later the strip was re-titled Chip Collins' Adventures with Wilhelm still at the helm. Another artist, Paul Frehm, handled some of the art chores; years later, Frehm would be the artist on Ripley's Believe It or Not. 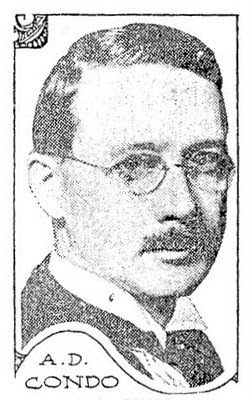 Gilbert Patten (a.k.a. Burt L. Standish), left, and Jack Wilhelm, right, Central Press photo. The first two Frank Merriwell's Schooldays strips. A record of his World War II military service has not been found. Wilhelm passed away on April 25, 1945, in Hines, Illinois. The Rockford Morning Star (Illinois) reported his death the following day. Hines, Ill., April 25.—(AP)—Jack Wilhelm, 42, staff artist for the Chicago Herald-American, died today in Hines Memorial hospital. Wilhelm, formerly a King Features syndicate cartoonist, came to the Herald-American following his discharge from the army six months ago. He was a native of Kentucky. Whatever happened to the obscure strips? All we ever see anymore are census records from ancestry-dot-com and cartoons taken from ChroniclingAmerica online and The NewspaperArchive sites from this Alex Jay guy. Please read Allan's earlier post. strippersguide.blogspot.com/2012/02/herriman-wednesday-special-announcement.html This month is all cartoonist's profiles. Well, I'm enjoying the information Alex. Guessing you're looking forward to April 2, when the government releases the 1940 census records, eh? Thanks D.D.! Counting down the days to the 1940 census coming to Ancestry.com. Louis Franklin van Zelm was born in New Rochelle, New York on December 9, 1895, according to his World War I and II draft cards. He has not been found in the 1900 U.S. Federal Census. The next census recorded him in New Rochelle, New York at 8 Banker Place. He was the oldest of our children born to Louis and Nettie. His father, a Holland emigrant, worked at an insurance company. The Portland Press Herald (Maine), August 13, 1949, said he graduated from Lawrenceville Prep. The New Rochelle Pioneer noted, on April 14, 1917, "Franklin van Zelm of this city, has won high honors for architectural students. He is a junior of the Massachusetts 'Tech'." He signed his World War I draft card on May 26, 1917. He was a student at the Massachusetts Institute of Technology. His description was tall, slender, with blue eyes and brown hair. The National Cyclopaedia of American Biography (1971) said he married Jane Morrison in 1918. In the 1920 census, he lived in New Rochelle on Overlook Road. His occupation was vice president at a metal company. For the New York Evening World, he drew the strip Rusty and Bub. During the 1920s he contributed cartoons to the Larchmont Gazette, and drew Such Is Life. A 1925 issue of The Technology Review (Association of Alumni and Alumnae of the Massachusetts Institute of Technology) noted van Zelm's career changed. ...All the yellow journals through the Middle West in mid-December printed long stories to the effect that L.F. van Zelm, whom we all remember as the best little cartoonist we had during our days at the Institute, has deserted architecture for cartooning, and is now cleaning up hordes of shekels as the perpetrator of a comic strip which makes a daily appearance in the dailies throughout that section. I feel sure all the gang join me in wishing Van the greatest success. The couple lived in New Rochelle on Wilmot Road, according to the 1930 census. 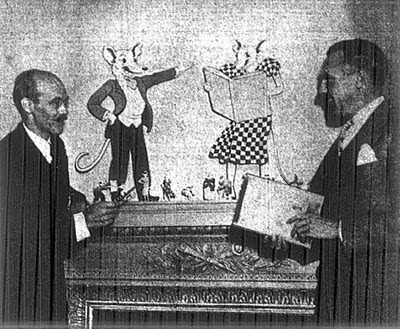 On November 19, 1938, the Herald Statesman (Yonkers, New York) reported van Zelm's collaboration with Darwin J. Adams on a children's book featuring two white mice, The Adventures of Monte and Molly. The story goes that the top of Summit Hill is a breeding ground for bald eagles because they can catch the high winds and hover. It was that view that apparently inspired L. Franklin Van Zelm, owner of the Summit Spring Hotel and water bottling company, to redesign the water bottle's label in the 1930s to include the iconic eagle…. ...Although the water had been sold for medicinal uses since the 1870s when the Summit Hill House opened, it was Van Zelm who first used the brown bottles with the eagle label, said Taja Dockendorf, principal of T. Doc Creative in Portland and designer of the limited-edition retro label. Van Zelm, an illustrator for the Christian Science Monitor, is credited with redesigning the label to include the eagle. In 1936, he built the beautiful spring house that encloses the water source, reviving the bottling plant that sits about 50 feet downhill and shipping the bottles to places like S.S. Pierce in Boston and even overseas…. The National Cyclopaedia of American Biography said his third marriage was to Marie Silver on June 21, 1954. The News and Courier (Charleston, South Carolina) reported, on February 20, 1955, that van Zelm filled his 50-room house, an old hotel, with gnomes and elves, and drew the daily cartoon, The VanGnomes, for the Christian Science Monitor. In 1958 he produced the strip Farnsworth. Van Zelm passed away March 24, 1961, in North Adams, Massachusetts, according to the March 26, Springfield Union (Massachusetts). Franklin Van Zelm's 3rd wife, Marie Silver, was my aunt. Loved reading about pieces of his life I'd not heard before. I have some photographs of him if they would be of interest. Van Zelm drew a very well-drawn and very funny daily comic strip titled "Aw, What's the Use." I discovered it by looking through the microfilm of The Bradenton (Fla.) Herald at the Bradenton Public Library. It was the first comic strip to run in that paper, starting Monday, May 7, 1923. That paper didn't seem to run it every day, but most days it ran the strip. I suppose that some days they didn't have room for it. It was copyright Western Newspaper Union. I didn't reach the last appearance of the strip in my research yet, but I will get back here with an update when I get the answer. It was the only strip running in this paper at the time. It was drawn in a clear line style reminiscent of George McManus and featured a man and his wife. It had a small narrow panel as the first panel, sort of like a title panel with a pictorial element that previewed the storyline. Eleanor M. Schorer was born on April 13, 1891, according the Social Security Death Index. A New York City native, she was the oldest of two daughters born to William and Martha, as recorded in the 1900 U.S. Federal Census. They lived in the Bronx at 1806 Anthony Avenue. Her father worked in housing construction. Ten years later the family remained in the Bronx at a different address, 2023 Morris Avenue. She found work at the New York Evening World. The Oregonian Magazine (Oregon) mentioned her in the article, "To Give Their Hearts but Keep Their Names", published on April 30, 1922. And those of you who know anything about New York must know that there is there a Kiddie Klub which interests thousands of youngsters. It was started by the Evening World, and its fame has reached other parts of the country during the six years of its existence. The originator and director of the "Kiddie Klub" is "Cousin" Eleanor Schorer. She was just a slip of a girl when she started being a "cousin" to all children in the big town. But, when Chester R. Hope, a newspaper editor, recently made her his wife, he agreed that she would not have to quit being Eleanor Schorer. For the children would hardly recognize "Cousin Eleanor" in the person of Mrs. Hope. Schorer applied for a patent. 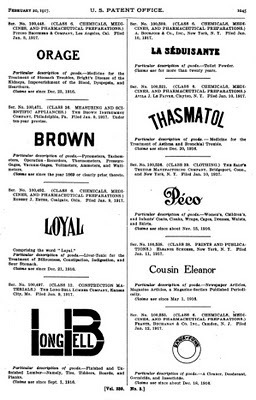 The Official Gazette of the United States Patent Office recorded the filing on February 20, 1917 (below). In the 1920 census the family of three lived in Bronx at 2055 Davidson Avenue. Her occupation was writer in the news industry. 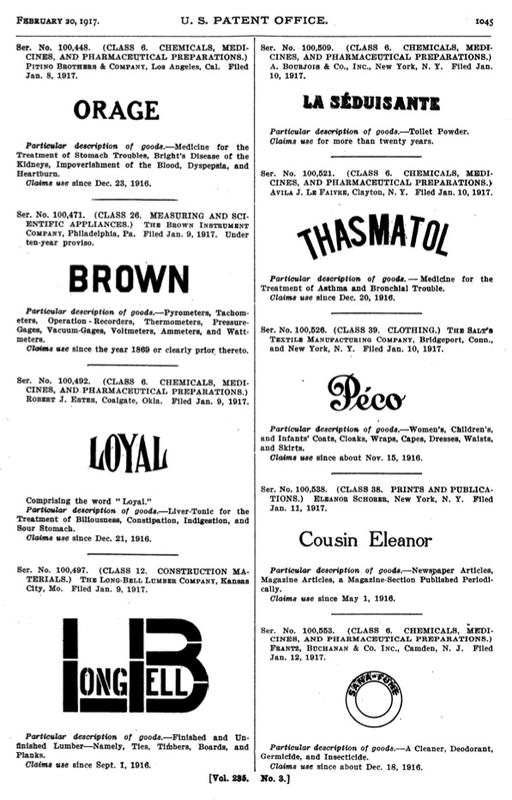 Her marriage to Chester Hope was announced in the New York Times on January 20, 1922. Miss Eleanor Schorer, formerly an artist and feature writer on The Evening World, and Chester R. Hope, an editor of the Newspaper Feature Service, were married yesterday at St. Mark's Church, the Rev. Dr. William Norman Guthrie officiating. For the last four years the bride has conducted the Kiddie Klub feature for The Evening World, and has written many children's books and plays. Mr. Hope was for ten years on the editorial staff of The Cleveland Leader. During the war he was a Lieutenant in the navy and attached to the Intelligence Bureau. They will spend their honeymoon in Provincetown, Mass. In 1926 she produced The Adventures of Judy. The couple has not been found in the 1930 census. Foremost Women in Communications (1970) has this entry on page 306. HOPE, ELEANOR SCHORER, Auth., "The Wishing Ring" (Harcourt, Brace & Howe, '19); play prod., '18; Free-lance Feature Wtr.-Artist, chief clients: Phila. Inquirer, St. Louis Globe Democrat, Toronto Star, starting '31; Wtr., Cartoonist, Dir. of children's activities. Hope's World War II draft card, signed in 1942, recorded his home address as 345 West 86 Street in New York City. 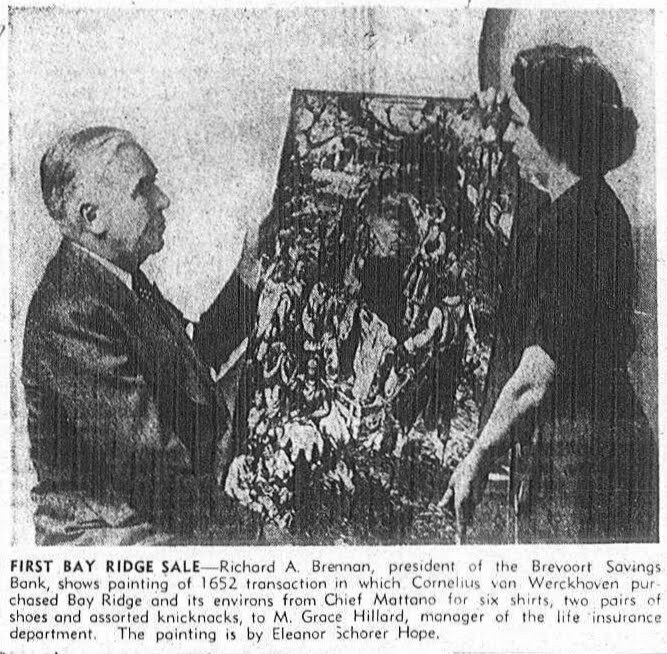 The Orangetown Telegram and Pearl River Searchlight (New York) reported on the newly organized Rockland Chapter of the Business and Professional Women's Clubs on August 1, 1947. Schorer was elected the Education and Vocations officer. During the 1950s, Schorer's paintings were exhibited at the Brevoort Savings Bank in Bay Ridge, Brooklyn, as reported in the Brooklyn Eagle. The Writer's Market (1951) published this listing: "CHESTER HOPE FEATURES, 345 W. 86th Street, New York 24, N.Y. Eleanor Schorer, Editor." Hope passed away, at home, on November 27, 1963. His death was reported in the New York Times the following day. Schorer passed away on February 24, 1976, in Palm Beach, Florida, according to the Florida Death Index. A.D. Condo, the man who draws Everett True for The States, was born some forty odd years ago near Toledo, Ohio. Long before Ardo was out of his teens, his father, a preacher, was killed in cyclone and the boy had to turn in and help make a living for the family. One of young Condo's earliest jobs was as a printer. Later he became an engraver. His natural drawing ability took him from the engraving department to the art staff of theToledeo News-Bee. Here he drew cartoons and covered regular assignments from fires to picnics. More than ten years ago he left Toledo and went to work for theCleveland Press. Condo's caricatures attracted much attention. Next, the Newspaper Enterprise Association secured his services. 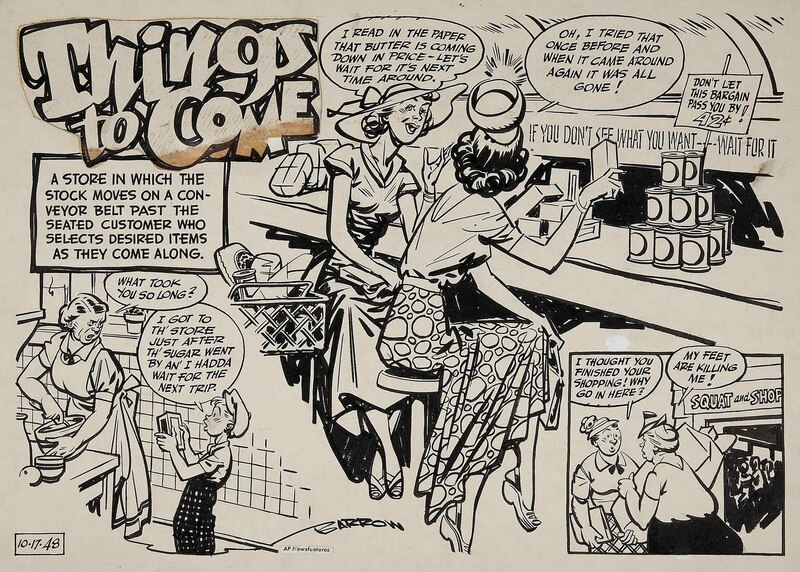 Today as a member of NEA's art staff, Condo is drawingEverett True for more than 250 of America's leading newspapers. Psychologists say each man's hero is his exact opposite. Everett is fat. Condo isn't skinny but used to be. Everett's "let's go" whenever he is displeased, landing with fists or his umbrella. Condo is long suffering and never had a fight in his life. He is big-hearted and loves children. "An acquaintance told me people pestered him into buying a Liberty bond," recounted Condo. "So he bought the smallest one he could get—$50. He's rich. It made me so mad I wanted to kick him." Condo didn't dare to do that so he had Everett administer the punishment. 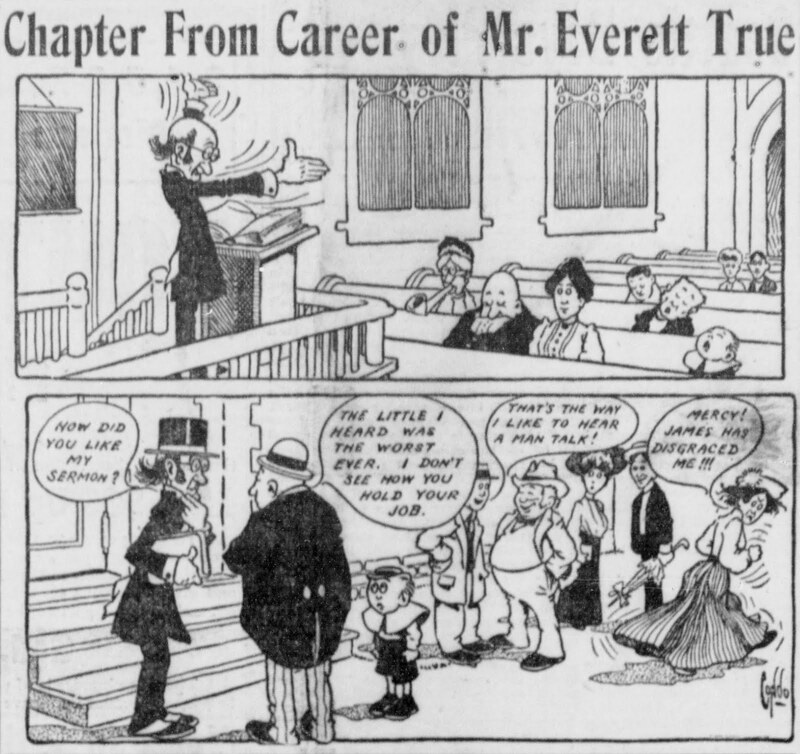 And that's the way Everett True first broke into print. Condo came to the office one morning after a neighbor's rasping phonograph had annoyed him unusually the evening before—kept him awake, in fact, long after he had retired. Why wasn't there someone to put a machine like that out of business, or to teach the owner of the machine a practical lesson, thought Condo. And before the day was over Everett was born—and the never-ending procession of pests has kept him busy ever since. Condo's home is in Berkeley, California. He is a widower and lives with his mother and his little daughter. [Armundo Dreisbach Condo was born in Freeport, Illinois on September 19, 1872. The Montana Daily Independent, November 18, 1923, reported his birth location. His World War I draft card had his birthdate. Dreisbach was his mother's maiden name. In the 1880 U.S. Federal Census, Condo lived with his maternal grandparents in Thompson, Ohio. The grandparents operated the Orphan Institute. His mother, Esther, and younger brother, Early, lived in Carthage, Missouri. His missionary father, Eli, was killed by a cyclone in Marshfield, Missouri, on April 18, 1880, according to Historical Data and Life Sketches of the Deceased Ministers of the Indiana Conference of the Evangelical Association, 1835 to 1915 (1915). In the 1900 census, he lived with his mother and brother in Toledo, Ohio at 430 Raymer Street. Both brothers were newspaper artists. 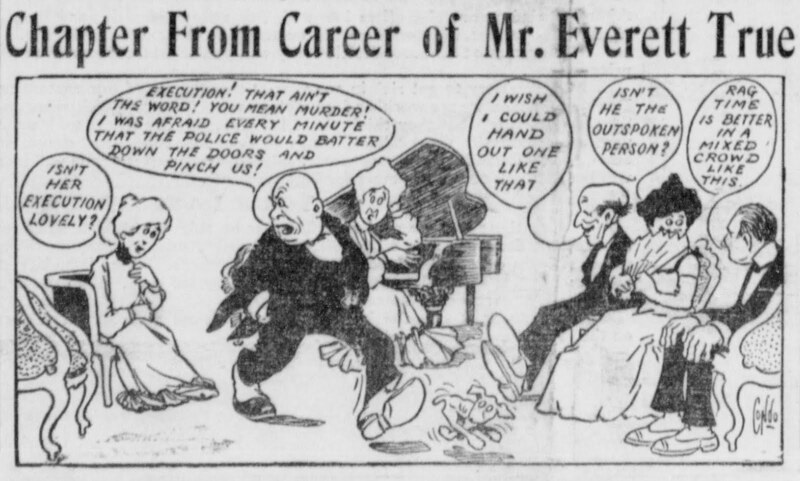 According to Don Markstein's Toonopedia, "A Chapter from the Career of Everett True, as the series was originally titled (it was quickly shortened to The Outbursts of Everett True), was created by A.D. Condo and J.W. Raper. It first appeared on July 22, 1905." Everett True panels can be viewed at Chronicling America. In 1908 he drew the panel, Mr. Skygack, from Mars. Condo, a widower, was recorded in Cleveland, Ohio at 10819 Tacoma Avenue, according to the 1910 census. He was the head of the household of four which included his three-year-old daughter. He was a newspaper cartoonist and his brother was a printer. 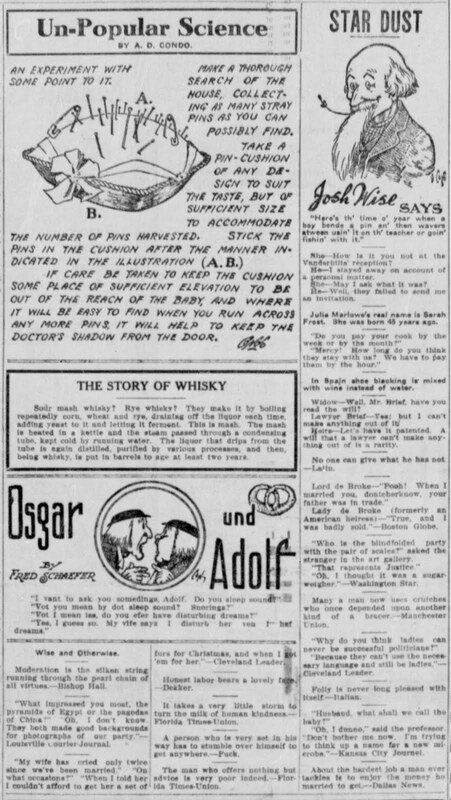 He drew the comic strip Osgar and Adolf from 1911 to 1915. 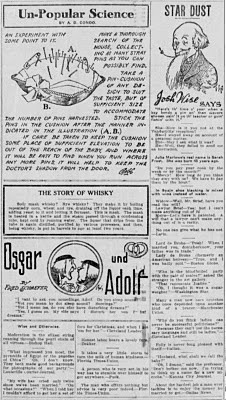 Condo wrote about his first newspaper assignment in Pep, January 1917. He signed his World War I draft card on September 12, 1918. He was an NEA newspaper cartoonist who lived at 964 Tulare in Albany, California. His description was medium height, slender build, with gray eyes and brown hair. In the 1920 census he, his daughter and mother were at the same address as the one on his draft card. He worked for NEA as an illustrator. Ten years later, Condo and his mother remained at the same place. He continued as a cartoonist. According to the California Death Index at Ancestry.com, Condo's mother passed away March 20, 1947, and he on August 24, 1956, in Albany, California. Condo's characters Everett True, Osgar and Adolf appeared in Alley Oop from the last week of March to the third week of April 1969.